Jodorowsky’s Dune is a 2013 American documentary film from director Frank Pavich. This movie is the story of film director Alejandro Jodorowsky’s ambitious plans to adapt the seminal science fiction novel, Dune, into a film during the mid-1970s. Dune is an epic science fiction novel that was originally serialized in the American science fiction magazine, Analog, over a two year period, from 1963 to 1965. Chilton Books published Dune as a hardcover in 1965. It won the first Nebula Award for “Best Novel” in 1965, and it shared the Hugo Award for “Best Novel” in 1966 (with …And Call Me Conrad by Roger Zelazny). In 1971, film producer Arthur P. Jacobs optioned the film rights to Dune, but died before he could develop a film. In 1974, a French consortium purchased Dune’s film rights from Jacobs’ production company. Alejandro Jodorowsky was set to direct the film. Jodorowsky was born in Chile in 1929. At a young age, he began writing poetry and later also became involved in theater. He moved to France in 1959, where he continued to work in theater and also made his first short film. He moved to Mexico and continued his work in avant-garde theater, but he later gained tremendous fame and notoriety for his work in film, beginning with Fando y Lis. His fame grew with the midnight movie cult classic, El Topo (1970), and with Holy Mountain (1973). In 1974, Jodorowsky began writing the massive script that would be his adaptation of Dune. He approached progressive rock (prog rock) groups like Pink Floyd and Magma to provide the film score. He sought out Salvador Dalí, Orson Welles, David Carradine, and Mick Jagger, among others, to act in the film. Jodorowsky hired French comic book artist Jean Giraud a/k/a Moebius (1938 to 2012) to draw the film’s storyboards and to provide concept art and designs. He hired British science fiction book cover artist, Chris Foss, to design space ships for the film, and Swiss surrealist, H.R. Giger (February 5, 1940 to May 12, 2014), to provide conceptual art and designs. After producing a massive hardcover book containing the script, the storyboards, and conceptual art, Jodorowsky and the film’s producers went to Hollywood, but were unable to convince any studio or anyone, for that matter, to finance the film. Jodorowsky’s project ultimately failed, but Jodorowsky’s Dune became a film legend. Director Frank Pavich interviews Alejandro Jodorowsky and the people who were his collaborators on the stalled Dune project to tell the story that is Jodorowsky’s Dune. The interview subjects include Jodorowsky’s son, Brontis, who was going to play Dune’s lead character, Paul Atreides. Producers Michel Seydoux and Jean-Paul Gibon talk about the overall process of trying to create such a large-scaled film. Film critics Devin Faraci and Drew McWeeney and film directors Nicolas Winding Refn and Richard Stanley talk about the project from a broader standpoint of art and of making movies in Hollywood. They also comment on how this failure still managed to be potent and influential. Artist Chris Foss and H.R. Giger talk about the sense of freedom that Jodorowsky gave them, and how he encouraged their imagination. When a director makes a documentary about a person, that person must be a fascinating or compelling figure. Alejandro Jodorowsky is both, and really, Jodorowsky’s Dune is as much about Jodorowsky as it is about his attempt to film Dune, if not more so. Jodorowsky might be insane or be a madman, but he is an artist and a cinematic visionary. Best of all, he wants to make the people who work with him reach for the genius inside themselves. That is the kind of guy around which a director can build a great or, at least, exceptional feature film. The other interview subjects, for the most part, are guys that I could listen to for hours as they talk about film, art, work, and life. However, the absence of Frank Herbert, the author of Dune, is conspicuous. Herbert died in 1986, and I can’t believe that there is no video or audio of him commenting on Jodorowsky’s attempt to make a film out of his epic novel. Dan O’Bannon, whom Jodorowsky hired to produce the special effects for Dune, died in 2009, but this documentary features audio of him talking about working on Dune. His widow, Diane O’Bannon, is featured in an on-camera interview in this film. The lack of Frank Herbert in this film is a minor complaint. Jodorowsky’s Dune is one of the best documentary films that I have ever scene. 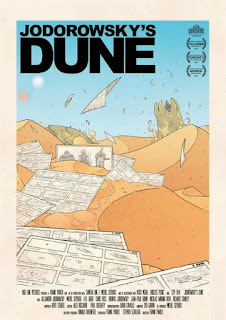 It inspires me to be creative, and it makes me wish I could find a way to get Jodorowsky’s Dune produced. I really want to see that movie. Maybe, if it had been made, his Dune would have been an overblown epic, but just listening to Jodorowsky makes me believe that the film is a lost masterpiece, although it doesn’t exist. Perhaps, the magic that director Frank Pavich performs in Jodorowsky’s Dune make me want to believe that this film project is still alive... somewhere.